March 31st 2013 - Update Mediation Buckinghamshire has launched a free service offering a way of improving relationships and resolving differences between neighbours, business customers, work colleagues and family members. Read more about it here. The Annual Parish Meeting takes place on Wednesday 8th May in the Church Room at 8pm. This is a public meeting and everyone is welcome to come along and talk about village concerns. You will also get an opportunity to have a say on how the proceeds for the fête should be divided up. Read the minutes from last year’s meeting here. A new Editor for the Aston Abbotts Chronicle is needed. Email us if you want to know a little more about what is involved. The 2013 Aston Abbotts Annual Fête will take place on Saturday the 27th July. Please come along to our traditional English village fête. January 2nd 2013 - Update Added a page on the Good Samaritans Bingo December 29th 2012 - Update Added some Astonbury 2012 photos and links to an Astonbury slideshow Added Ian Watts’ Village Orchard pictures showing the orchard one year on Added Ken Rhodie’s pictures of the Autumn 2012 Village Orchard Planting Added November’s Community News [Apologies for the slowness of these updates] December 29th 2012 - Terry Daniels’ Book Pat Daniels’ daughter Terry has written a book about her frightening true story when she was falsely accused of trying to smuggle cocaine into Spain. The book is called Passport To Hell and it is available from Amazon here. July 4th 2012 - Update Added John Hardcastle’s photos of the Aston Abbotts Jubilee Picnic held on June 4th 2012. Added May 2012 Community News. June 25th 2012 - Update Added first photos of the Aston Abbotts Jubilee Picnic on the recreation ground. 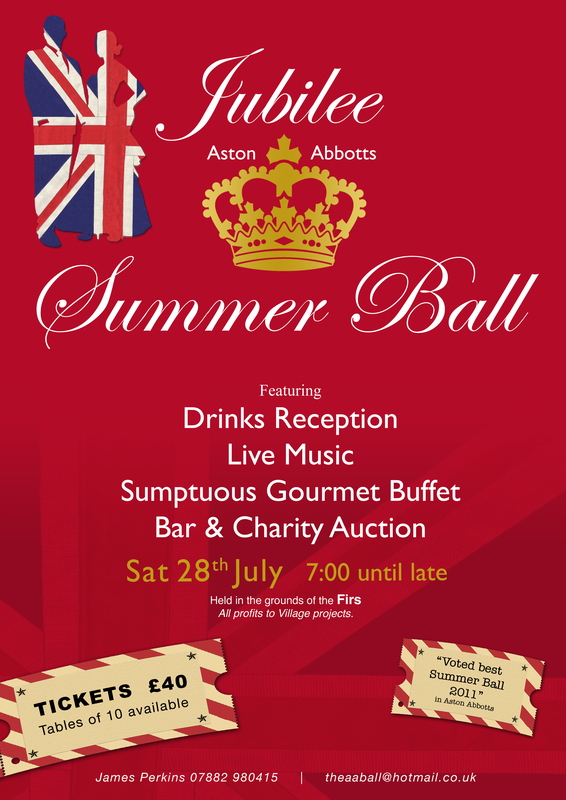 June 9th 2012 update - Summer Ball 2012 The Aston Abbotts Summer Ball will take place on July 28th 2012. Don’t miss it! Click on the poster on the right to read more about it. June 9th 2012 update - Summer Fete 2012 Don’t miss Aston Abbotts’ traditional summer fete which will be held on Aston Abbotts village green on Saturday July 28th from 1pm onwards. Lots of stalls and fun things to do - rides for the kiddies, tombola. bric-a-brac, book stall, coconut shy, music, food, drinks, raffle, and lots more. Then after it’s all over why not come to the Summer Ball - see the item above. May 12th 2012 - New Astonbury Website Launched The 2012 Astonbury will take place on Saturday 7th July 2012 at 6pm. Visit the Astonbury 2012 website or read more about Astonbury. April 11th 2012 - Annual Parish Meeting Agenda The 2012 Annual Parish Meeting will take place in the Church Room on Wednesday May 9th 2012 at 8pm. This is a public meeting and everybody is most welcome. At this meeting you can hear reports and updates about the village, ask questions, and have a say in how the fete proceeds are spent. You can get the agenda for the meeting here - and you can also read the minutes of last year’s meeting here. Please do come along if you are interested in what is happening in Aston Abbotts. March 29th 2012 - Update Added March 2012 Community News Added pictures submitted by Christine Scott and Hannah Brandon January 30th 2012 - Update Added information on Community Impact’s Heating Oil purchase syndicate here. January 23rd 2012 - Updates Added a page of historical Aston Abbotts photographs supplied by Peter Kent here. Added January 2012 Community News January 6th 2012 - Updates Added Christmas Lunch 2011 photos by Ken Rhodie Added December Community News December 14th 2011 - Updates Added November Community News November 7th 2011 - Updates Added October Community News Added Neighbourhood Policing Newsletter October 2011 Added AVDC’s Parish Newsletter October 2011 Added Keeping Safe Advice Added link to Simon Guys New Zealand Rugby Tour blog A New Flightpath Over Aston Abbotts? Cranfield airport, located approximately 10 miles from Aston Abbotts have circulated a consultation document for a new instrument landing approach that would bring aircraft in directly over Aston Abbotts. These will be small business jet and turbo-prop aircraft - e.g. Learjets. If adopted the proposal would see these aircraft fly over Aston Abbotts at a height between 2000 and 4000 feet and it is hard to judge how much impact this will have on the village. It is important to stress that that this is just a proposal at this stage. The diagram on the right shows the planned runway approach (click on it to enlarge it) and the full consultation document can be read here. October 22nd 2011 - The Village Orchard At 10.30 am on the morning of 22nd October Christine Scott planted the first tree, a Stewkley Plum, in the Vic Scott Memorial Orchard. Christine then spoke a few words of thanks and said how appropriate she thought the village orchard project was as a memorial to her late husband. Planting of further trees then continued throughout the morning attended by many of those who have sponsored trees, many in memory of their own loved ones. Pictures of the planting can be seen here. October 10th 2011 - Neighbourhood Planning Questionnaire online The Parish Council is urgently seeking villagers’ views on Aston Abbotts planning Policy. Under proposed new government legislation the planning process will be simplified and planning permission will be granted in accordance with the village’s Neighbourhood Planning policy. Without a proper plan in place we could be vulnerable to much more development. The Neighbourhood plan is not the same as the Village Plan which is also currently being developed. If you wish to contribute your views toward future Aston Abbotts planning policy then please download a copy of the questionnaire here and return it by October 23rd (deadline now extended until end November). This is an Acrobat PDF document - please print it, complete it and return it to one of the people listed in the document. Further information about the Neighbourhood Plan and the reasons why it is so important can be found in the October issue of The Chronicle. October 6th 2011 - Updates Added Community News September 2011 Added Community News August 2011 Added Community News August 2011 Added Village SOS Competition and Local Training September 27th 2011 - Updates Added Astonbury X photos Added Ken Rhodies photos Added Villagers photos Added How It Used To Be photos Added Chunkees Wonder Of You video Corrected some minor errors September 2011 - NEW WEBSITE LAUNCHED Finally Aston Abbotts has a new website to replace the old one, which hadn’t been updated for five years. It was a problem updating the old website as the tools used to create it were obsolete. It is planned to update this website a little more regularly... If you would like to see something specific on this site, or maybe you have a few interesting photographs of Aston Abbotts that you would like considered for inclusion in our gallery pages, then please get in contact with the webmaster. We would particularly like to have any photographs of Aston Abbotts in the past, even if it is only the recent past. This is your new website. We hope you enjoy it. July 2011 - Vic Scott Memorial Orchard Plans for a village orchard - to be called the Vic Scott Memorial Orchard - with 200 trees planted by villagers are now well under way. Full details, including how you can be a part of it, are in the July/August 2011 Chronicle. March 2011 - Vic Scott Passes Away Lifelong Aston Abbotts resident Vic Scott passed away in March 2011. Vic will be fondly remembered by many villagers. The quizzes he and Christine held in The Church Room were always a delight. You can read Vic’s obituary in The Bucks Herald here.